When 250,000 people marched on the National Mall 50 years ago they demanded among other things a hike in the minimum wage from $1.25 to $2 an hour. Today thousands of fast food workers are holding a one-day strike in cities across the country, demanding a wage of $15 an hour. That's equivalent to the $2 an hour protestors called for in 1963, after adjusting for inflation. 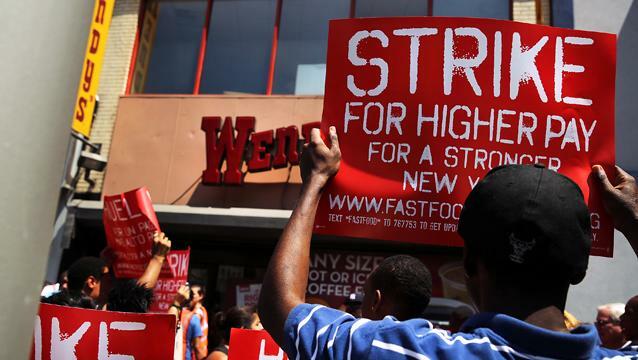 Organizers report that workers have walked off their jobs in 60 U.S. cities today, including New York City where 500 striking workers took over a McDonald's at 5th Avenue near 34th Street, and the Empire State Building. In addition to a $15-an-hour wage, protestors want the right to form a union without intimidation or retaliation from their employer. Kendall Fells, the organizing director of Fast Food Forward, which is overseeing the New York City campaign, tells The Daily Ticker that these workers are not demanding that Congress raise the minimum wage but that the companies that employ them pay a living wage. “You used to have fast-food industry where teenagers were trying to get Jordans and jeans,” says Fells, referring to the high-top sneakers named for basketball great Michael Jordan. "Now the average age is 28 years old. Most of the workers are women…They have children. They have rent. They need clothing. They need shelter.” But they usually make the minimum wage of $7.25 when they need more than $20 an hour in New York City just to survive, says Fells. Related: The Great Wage Debate: Should Companies Pay Workers More? He blames fast food companies for these low wages and says they can afford to pay workers more. McDonald's and other fast food chains employ over 4 million workers nationwide. Paying those workers more money would not only help those workers but the broader economy as well, says Fells. "It's low wage workers...that actually spend the money and actually get the economy back running." It's also low-wage jobs that are the fastest growing segment of the U.S. job market, accounting for about 70% of new jobs created in the second quarter, says Dan Alpert, managing partner at Westwood Capital. Ahead, he sees "a hard row to hoe" for labor organizers and fast food workers because there are so few other jobs available and so many people are looking for work. Watch the video above to learn why some fast food workers are willing to battle those odds for higher pay. Apple's Cheaper iPhone: How Low Will They Go?